Every phone manufacturer these days touts the charging capabilities of its high-end devices. 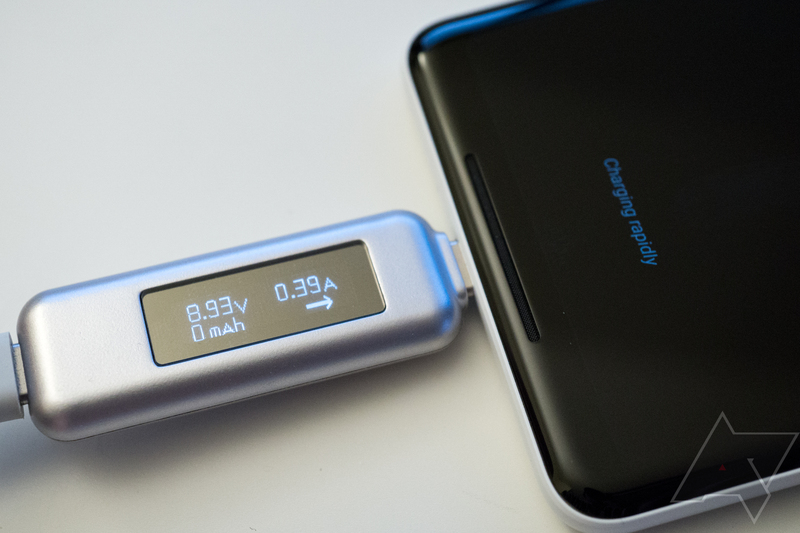 Most of us are probably familiar with Qualcomm's various Quick Charge specifications, which it licenses to companies like Motorola and Samsung, but there are also other solutions out there. 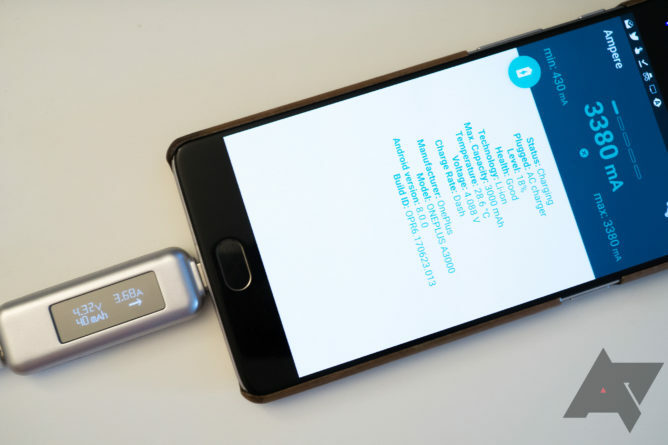 USB Power Delivery is an open standard that's growing more ubiquitous with each day, and OnePlus' Dash Charge breaks records—even as it breaks the USB-C spec. With all these different ways to charge your phone, how can you actually measure what rate it's charging at? Depending on your budget, there are plenty of ways you can get the numbers you need. But determining what numbers you want is sometimes just as difficult. That's why we've put together this guide to help you measure things like wattage or amperage the way we do here at Android Police. By far the easiest method for gathering numbers is to use a meter. 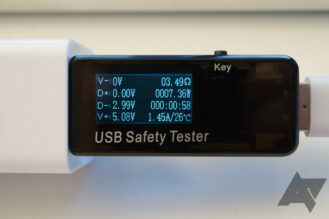 While you could rip up a cable and rig up a multimeter for your own measurements, an in-line solution like Satechi's $30 USB-C Power Meter or Eversame's $10 USB Digital Power Meter may be a cheaper, lower-effort solution. Plus, they're easier to read and use. 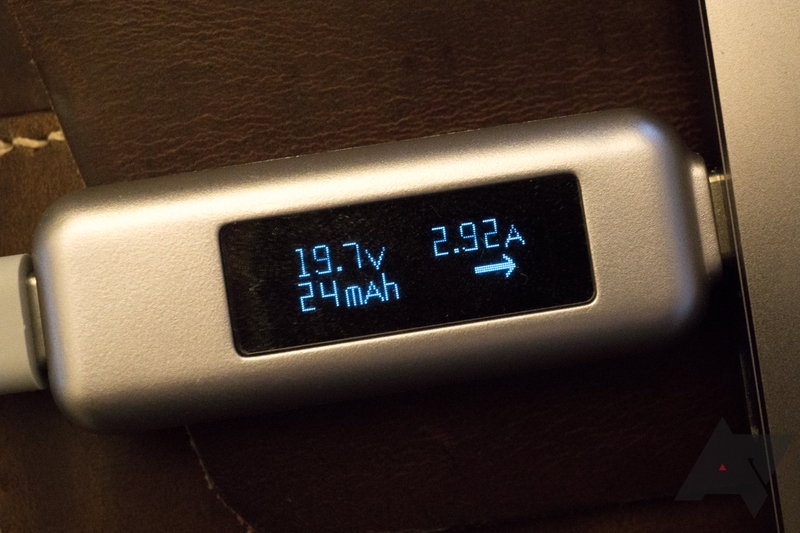 Ampere is great in a pinch, but there's a bit of a difference between 3.68A and 3.38A. Even if you get a hardware meter like Satechi's, don't expect perfect measurements. Unless you're willing to step things up significantly, you'll probably have to settle for "good enough," and a $10-30 meter does a decent job. This isn't astronomy, we're aiming for a bit more accuracy than an order of magnitude, but if we're within 1/10th of an amp or volt, it's probably fine. Once you've got the hardware on hand to make a reasonably accurate measurement, all that's left is to actually take some numbers. But you'll want to make sure that you record them in the correct circumstances. First, you need to figure out what it is you'd like to measure, as some things are easier to determine than others. 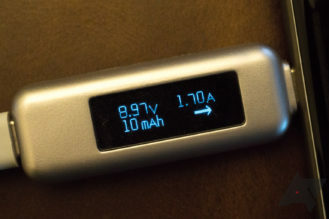 Sometimes all you're interested in seeing is peak voltage/amperage (i.e., the fastest that your device can charge or which your power supply can provide). We take measurements like that pretty often for device reviews, like when we want to determine how many watts a given portable battery can spit, or the maximum charging rate of a specific phone. And, frankly, these are the easiest numbers to get. You'll want to ensure you've got your testing setup assembled in the right way to measure peak voltage, amperage, and wattage. To make sure your phone (or other device) is pulling the maximum numbers it can, it should be drained as low as possible. Generally speaking, the more charged a battery is, the less power it will try to pull. So drain your phone down nice and low. In some cases, Like Google's Pixel 2 XL, a device's peak numbers aren't sustainable. It's up to you if that matters for your test case, but keep in mind that you might see a decline more quickly than you would otherwise expect, and if you see that occur, you may have to modify your testing methodology as required to compensate. If you want to precisely measure long-term numbers, that's much more difficult. For example, when measuring exactly how long it takes to charge a phone, the only way to accurately do that is to literally just plug it in and wait. The stats from a meter, combined with known battery specs, can provide you with an idea for how long it may take to charge, but you don't know how quickly the voltage or amperage might drop off as the battery fills up. Charging graph demonstrating current falling with time while charging, courtesy of Battery University. Similarly, if you need to measure average voltage or amperage, you'll have to determine if you want to take into account that gradual tapering off or not. The longer your device is plugged in, the lower the numbers you should expect to see, generally. Sustained numbers require more attention to test, and if you're using an external consumer-level meter to pull those numbers, your best bet is to rig up a camera. That way you can measure either charging duration or gather samples from displayed results for averages as you require. Plug your phone (or other device) into a cable connected to the meter. The precise configuration will vary based on the device or meter. 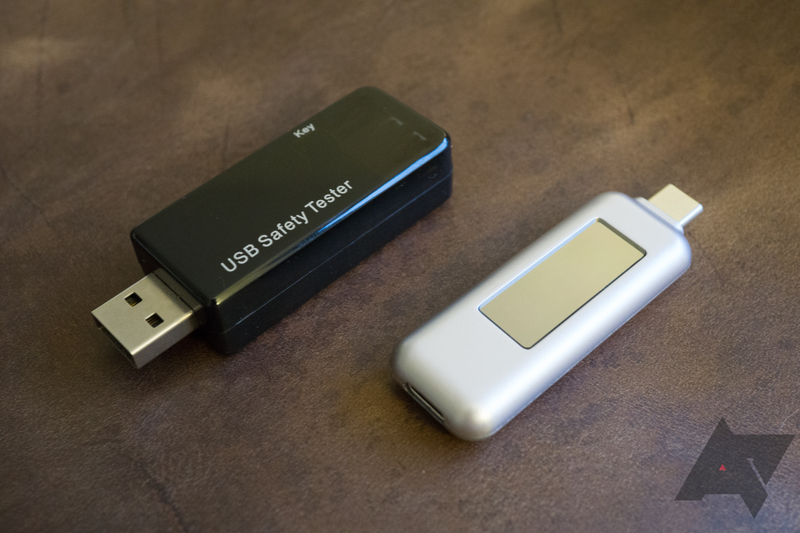 USB-A meters will probably be attached at the power source, USB-C meters are more flexible—but you should try to place the meter on the device end if you can, due to voltage sag. Plug the other end of the cable (or meter) into your power source. Measure your numbers as the meter displays them. 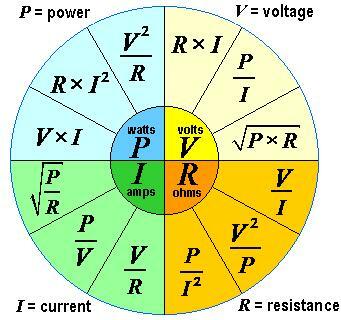 V is usually the voltage, A is the amperage. If your meter shows more than one set of numbers (which it may for different pins), you're typically looking for the highest number. Refer to your device manual to be sure. Ultimately, it's pretty simple to get the numbers. The only real difficulty stems from knowing what you want to measure, the best way to set up your testing environment to get it, and knowing what to do with the numbers once you have them. The formula just north of 9 o'clock is all you really need to remember. If you want to measure watts and you don't remember back to 7th-grade science (no shame), that's easily calculated thanks to our good friend Ohm's law. Just multiply the reported voltage by the amperage (P=V*I), and voilà. 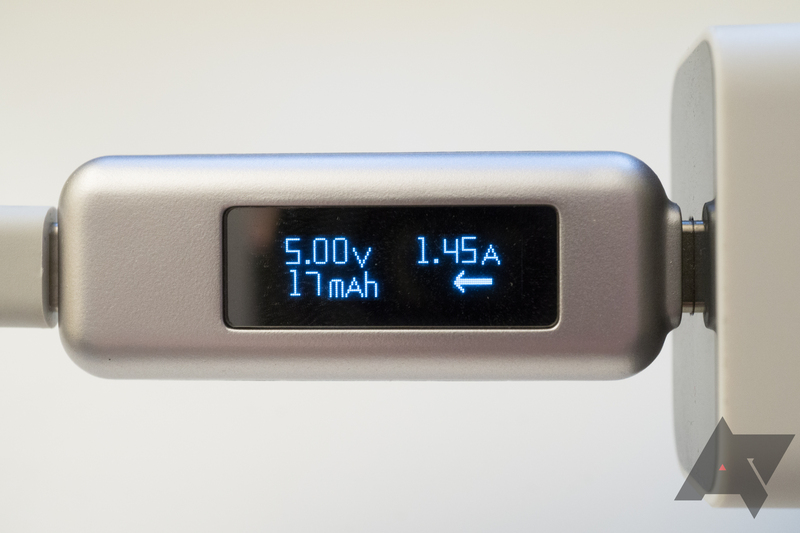 Example measurements from our recent 75W Satechi Charger review. For a good example, here are two sets of numbers pulled from two different devices, each plugged into the same power source. The device on the left is pulling 57.52W (19.7V*2.92A) which is very nearly the maximum for the charger it is connected to. The device on the right, on the other hand, is pulling 15.25W (8.97V*1.7A). Keep the screen off for best results. A lower battery will generally pull higher numbers. Lower or higher temperatures can affect things (as we noted in some of our recent tests). Keep your testing environment at around room temperature. mAh measurements on external meters, such as Satechi's, are often inaccurate or misleading. Generally speaking, they aren't really to be trusted. Keep in mind hardware limitations. 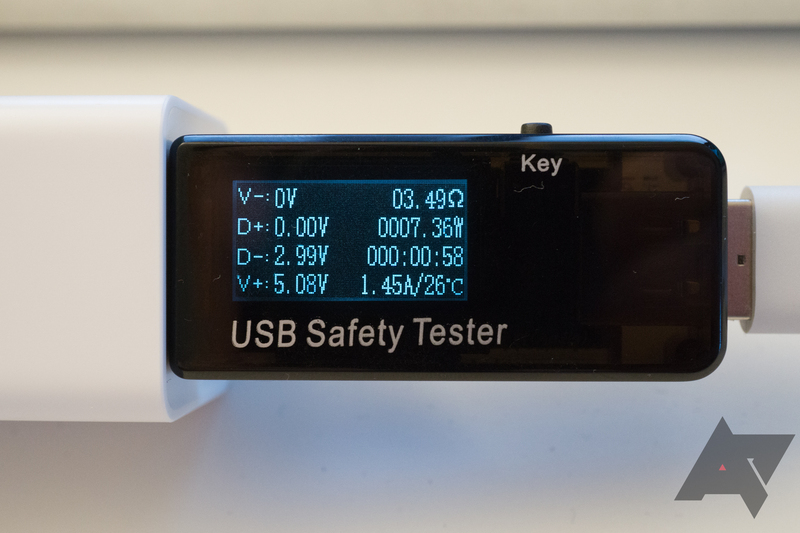 If you're using a USB-A meter to measure Dash Charge numbers, it lacks the extra pin that it needs to work. 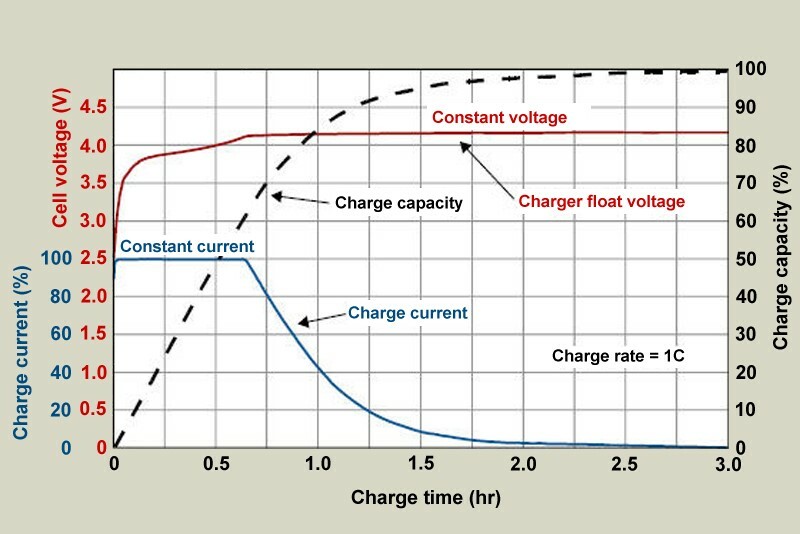 In the same vein, your charger's peak voltage, amperage, or adherence to Quick Charge or USB-PD spec may be a limiting factor. An 18W Pixel OEM charger can't provide 70W to a MacBook Pro, and a cheap charger might not meet spec. At first glance, it might seem daunting to pull technical-seeming numbers like these, but in fact, it's quite easy. All you really need to know is what you want to measure, and have the hardware on hand to do it. Actually getting those numbers is much simpler.